Did you see our new kitchen? Okay, it may not be new, but it looks like a completely different kitchen thanks to our partnership with The Home Depot, right? Not sure what I’m referring to? Head over to see how we transformed our builder grade kitchen into a farmhouse kitchen! 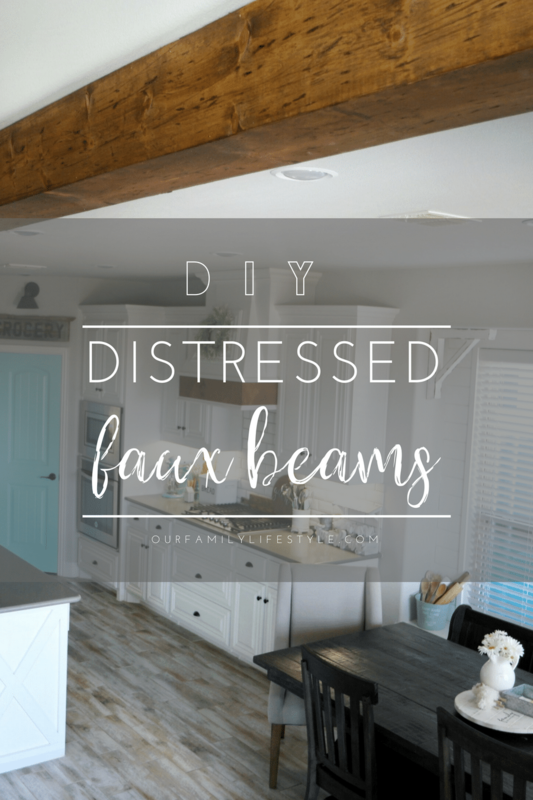 Two of my favorite parts of the whole restyle are the DIY distressed faux beams. Y’all, we took three common pine boards, beat them with chicken wire (because it’s what we had on-hand) and a large chisel, stabbed them with a screwdriver, and ran a hand weeder down them. 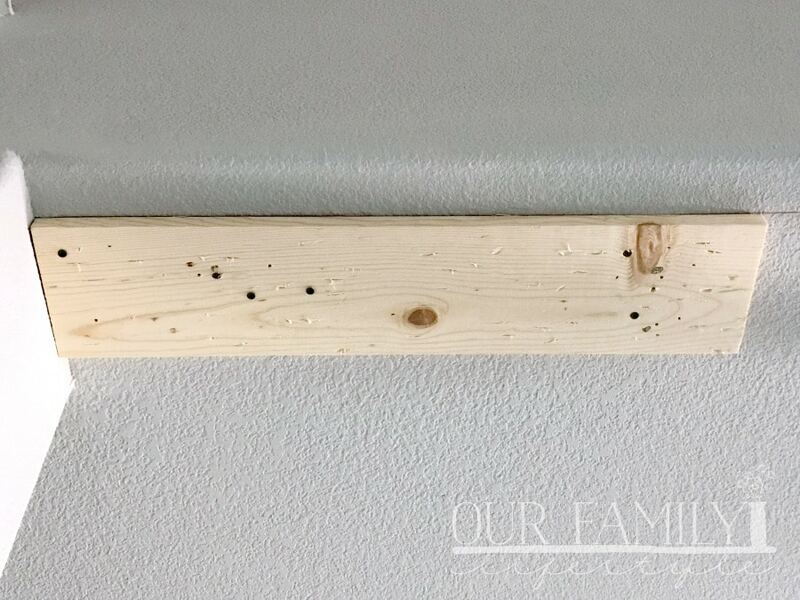 We wanted to give the wood beam a good rustic look, and this was one way of doing that. I think Colby had a bit of fun doing this actually; especially when it came to the chicken wire. It looked like a great stress relief exercise if I’m being honest. In fact, it addition to beating the wood with the rolled bunch of wire, he would also grate the boards with it. Basically, these faux wood beams now hanging in our kitchen are hand hewn. I kinda love that! 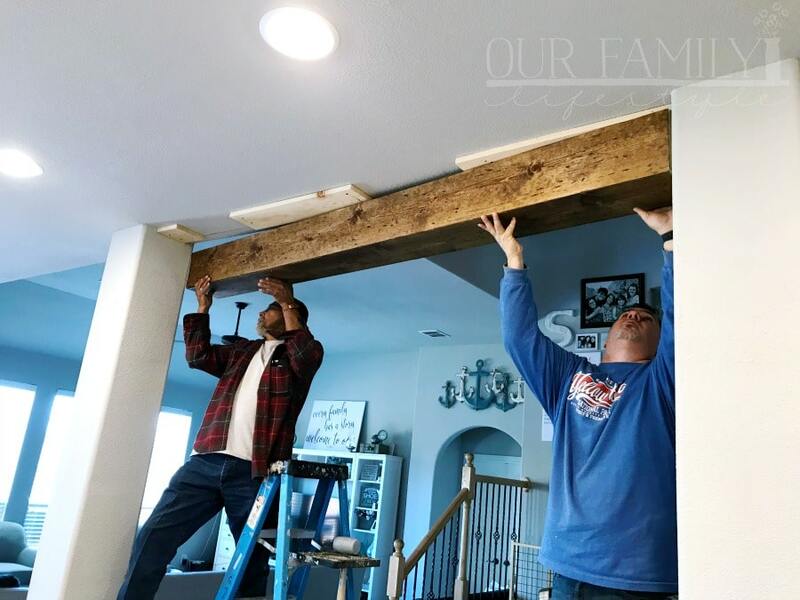 Once we had all of the pieces distressed to our liking, it was time to assemble the decorative beams. Colby cut one side of two the boards at a 45° angle. The middle board needed two 45° angle cuts on each of the long sides. Then, he lined each angled side up to make a U-shaped, three-side faux wood beam. Using the angled cuts trimmed from the side boards, he added some stability to the beams by nailing the pieces inside as shown above. Next, it was my turn. 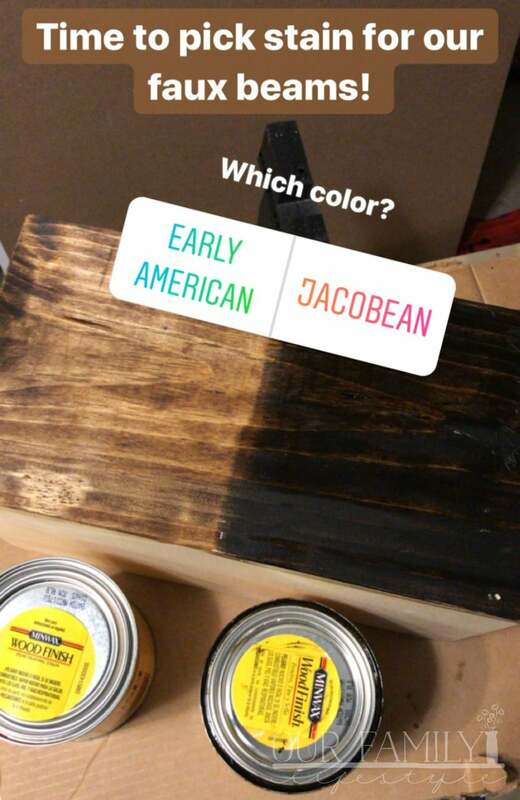 We tried two different wood stains to see which we liked best (Jacobean which we used on our farmhouse table and Early American). After letting them dry overnight and putting it to a vote on Instagram, Minwax Early American won. Good thing because it was my favorite as soon as I applied it. Therefore, I stained the outside of each ceiling beam with the wood finish. After they all dried completely, it was time to bring them inside to hang on the ceiling. Now, as exciting and easy as that may seem, it was a bit of a chore for us. My dad is a retired carpenter. Therefore, we worked under his guidance during this process. Now, perhaps our idea of building codes was a bit skewed, but we were looking for the ceiling joists to be every 16″ to 18″. That wasn’t the case in our ceiling. We weren’t getting a reading using our stud finder, so we had to go old school—drilling until we hit something solid. We would then measure and drill again. 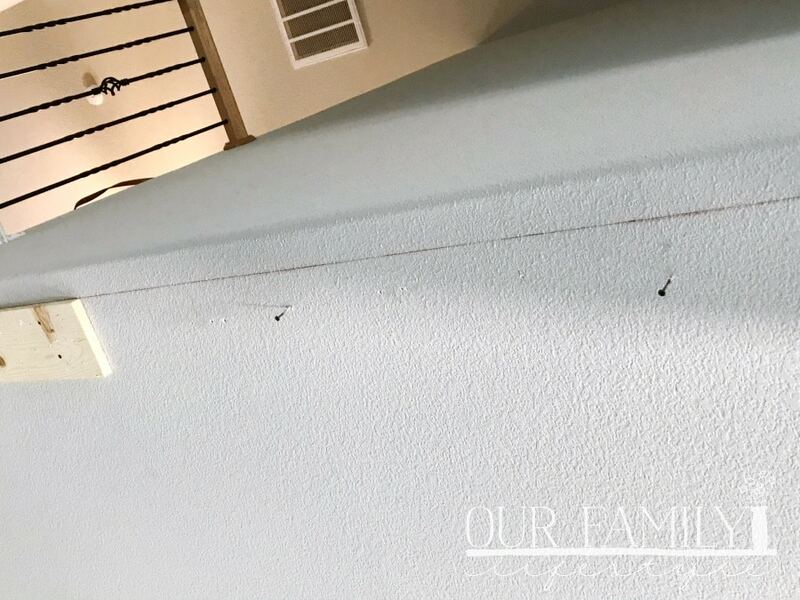 We soon discovered our joists were anywhere from 21″ to 24″ apart. 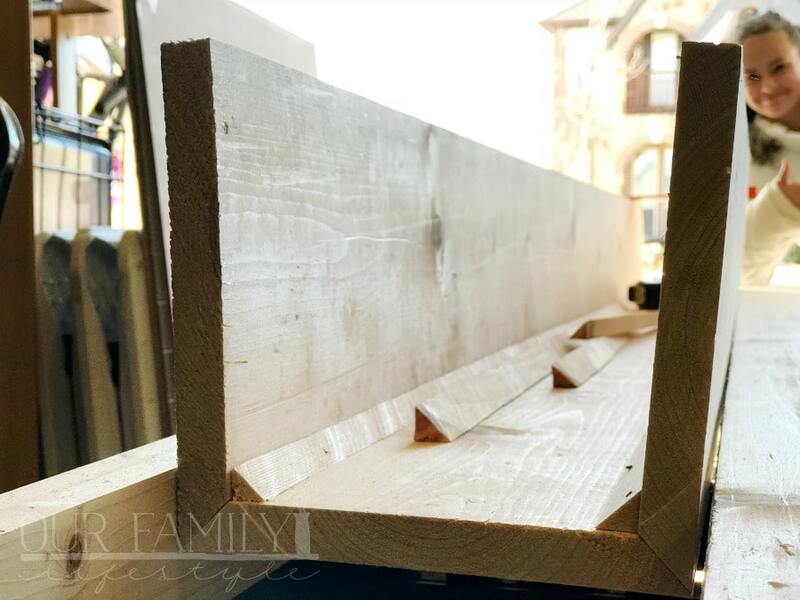 So, once you can determine where your joists are, it’s time to attach the cleats that you will be nailing your beams into place with. We popped a chalk line to keep us straight as far as the outer edge of the cleats and began screwing them into place. You’re done! I mean, I had to do some touch up paint on the columns because it was tight fit with the beams (which was intentional) but otherwise, this is the last step! And the difference? WOW! I have envisioned these faux wood beams ever since we were building. I knew exactly where they would go and could not wait to see them in the space. I knew they would look fabulous–and I was totally right! Look at those distress faux beams and how much depth they add to the space!